Liberty is a modern apple variety, developed for disease resistance - it has very good resistance to scab, fireblight and cedar apple rust. Liberty's disease resistance comes partly from a crab apple variety called Malus floribunda which is one of its distant ancestors, but it gets its clean well-balanced flavor from its immediate parent Macoun and grand-parent McIntosh. 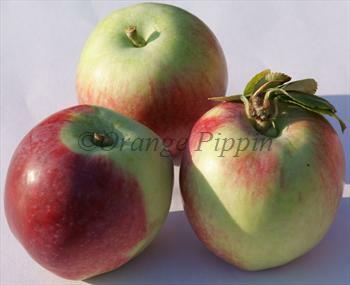 It also has the bright white flesh and sweet "vinous" flavor which is a characteristic of almost all apples which are descended from McIntosh, but with perhaps a bit more tartness. Overall the flavor can be considered first class with no compromise for being disease resistant. Although primarily an apple for eating fresh, it can also be used for applesauce - which will be pink if you leave some of the skin on. 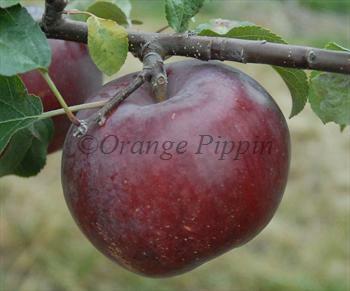 Fill in the details below and we will let you know when Liberty apple trees are back in stock. The natural disease resistance make Liberty an excellent garden apple, particularly for fans of McIntosh-style apples. It is one of the best choices if you live in an area where cedar-apple rust (CAR) is prevalent, as it is very resistant to this disease - although note that "disease-resistant" does not mean "disease-proof". Liberty trees are fairly vigorous and precocious. 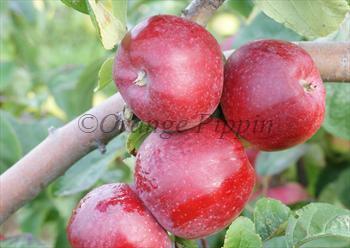 The fruitlets will require thinning in most seasons, to avoid a very large crop of very small apples. The apples ripen over a period so you do not have to pick them all at once. Liberty will grow in most climates - it is probably better in cooler regions, but performs well in warmer climates including southern California . It is generally a fool-proof and reliable apple. There is some evidence that Liberty is a triploid variety - with 3 sets of chromosomes instead of the more usual 2 sets (diploid). Triploid varieties often have good disease resistance, but Liberty does not have some of the other physical characteristics associated with triploid varieties, such as very large size and vigour. There is also some evidence that Liberty might have a degree of self-fertility, and again this is sometimes seen in other triploid varieties. Overall we think it is best to assume Liberty will not pollinate other apple varieties and is not self-fertile, but other compatible apple and crab-apple varieties will readily pollinate Liberty. Liberty was developed at the Geneva Experimental Station, New York and introduced in 1978. It is related to Macoun. During the research program which led to this variety, seedling trees were exposed to scab spores, cedar apple rust spores, and fireblight.